Highlights add lighter color to dark hair whereas lowlights add darker color to light hair. Used separately or together, they give an outdoorsy sun-kissed look to your features. 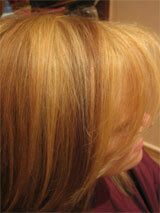 For artificially colored hair, highlights and/or lowlights provide the textured look of naturalness. And for natural hair, they provide added texture, shine, and definition. Either can be created using hair color or extensions – your choice. When choosing extensions, I recommend the Microchet Extension method of application. Foil highlighting — Best done by a professional colorist at the salon because this technique requires precise application to avoid bleeding and streaking. Done correctly, the results can be quite striking and attractive. Pintura — (pin-tur-ah) The idea of baliage (bay-lee-ahge – free-form hair painting) but upgraded to a more refined and sophisticated method. Pintura is free-form hair painting that is individualized for your unique style, curl pattern and hair type. This technique produces totally individualized results and is the preferred technique for curly hair. How the curl lays and fits in with the rest of your hair is analyzed so that the highlighting will show to best advantage. Coloring curly hair is one of my specialties. Although this is the preferred method for curly hair, it is also an amazing way to get beautiful, natural to extreme highlights and/or lowlights in all hair types without the “zebra” look. Painting caps — Not recommended for long or curly hair. Although caps can be useful on some heads of short hair when used by an experienced professional, for long or curly hair they are difficult to remove and can pull the hair causing pain or even breaking the strands. Pale skin? Choose any hair color. It will look good. Red shades look particularly good. Pink skin? Avoid reds and golden blonde. Yellow complexion? Choose deep reds or other colors. Avoid yellow, gold, or orange tones. Olive? Choose dark colors for highlights and red or brown shades for lowlights. Brown hair? Try dark brown lowlights. You could also try gold. Black hair? Try auburn highlights. Red hair? Stay soft with silvery browns, golds, or copper. Getting a few grey hairs? These can be hidden very effectively with highlights. For shading, stay within 2-3 shades lighter or darker than your base hair color. This will give you a more natural look. After application, wait at least 24 hours before shampooing. This gives the color a chance to set and become a permanent part of the hair shaft. The longer you wait to shampoo after application the better. Use warm water – not hot. Use hair care products that are specifically created for chemically treated hair. Use color depositing shampoo every other time you wash your hair. Avoid chlorine. If going to a pool, apply a leave-in conditioner before going into the water. To see more photos of hair highlights and lowlights, click here. Middle East +971529212453 Available in Dubai, the UAE, Middle East and surrounding area. USA 516-816-6452 based in AZ. Available to travel all 50 states.